David Fitzgerald Doyle (December 1, 1929 – February 26, 1997) was an American actor. Doyle was born in Omaha, Nebraska, the son of Mary Ruth (née Fitzgerald) and Lewis Raymond Doyle, an attorney. His maternal grandfather, John Fitzgerald, was a prominent railroad builder and banker in Nebraska. He graduated from Campion High School in Prairie du Chien, Wisconsin, in 1947. He is best remembered for his role as detective John Bosley on the television series Charlie's Angels, one of only two actors (the other being original angel Jaclyn Smith) to appear in all 110 episodes of the series (1976–81). He lent his distinctive raspy voice to the character Grandpa Lou Pickles on the Nickelodeon animated television series Rugrats until his death. Joe Alaskey then assumed the role of Grandpa Lou. Doyle made a number of appearances as a guest on the game show Match Game in the late 1970s and early 1980s. He appeared on one week of Password Plus in 1980, three weeks of Super Password, and on Tattletales with his wife Anne in 1982. Doyle was a stage actor, as well. He played Orgon in the 1964 premier of Richard Wilbur's translation of Tartuffe at the Fred Miller Theater in Milwaukee. His sister Mary played the fulminate maid, Dorisse, in the same production. Doyle was married twice. He married his first wife, Rachael, in 1956. Rachael died falling from a staircase in 1968. They had one child, a daughter named Leah, in 1961. While on a trip in the South Pacific in 1969, Doyle met Anne Nathan, a singer-dancer. They were married a short time later. Doyle died in Los Angeles, California, of a heart attack on February 26, 1997, aged 67, and was cremated. Doyle's sister, Mary, was a stage actress. Mary died from lung cancer in 1995. 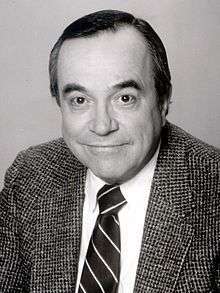 ↑ "Obituaries | David Doyle, `Charlie's Angels' Character | Seattle Times Newspaper". Community.seattletimes.nwsource.com. 1997-03-01. Retrieved 2014-01-13. ↑ "David Doyle Actor | David Doyle, 67, popular character actor easily recognized... - Baltimore Sun". Articles.baltimoresun.com. 1997-03-01. Retrieved 2014-01-13. ↑ "`CHARLIE'S ANGELS' ACTOR DIES OF HEART ATTACK AT 67". Deseret News. 1997-03-02. Retrieved 2014-01-13. ↑ "David Doyle; Actor on 'Charlie's Angels' - Los Angeles Times". Articles.latimes.com. 1993-09-17. Retrieved 2014-01-13. ↑ Reilly, Sue. "Farewell, Farrah - Charlie's Angels, David Doyle". People.com. Retrieved 2014-01-13.